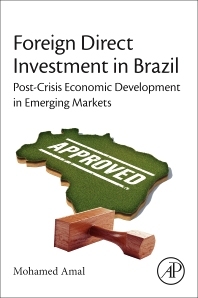 Foreign Direct Investment in Brazil: Post-Crisis Economic Development in Emerging Markets explores both the inward and outward ways foreign direct investment (FDI) can help Brazil sustain economic growth and development in the sometimes hostile post-global crisis era. Inward and outward FDI have major roles to play in reviving Brazil’s growth momentum and the country’s transition to a new growth paradigm less dependent on commodity exports. The book provides a comprehensive discussion on the analytical framework of FDI and the policy environment influencing the patterns and development of FDI in Brazil. It compares Brazil to other developing countries, but its focus rests on how, and to what extent, the global crisis is shaping the Brazilian institutional environment and its implications for FDI. Upper-division undergraduates and graduate students worldwide working in comparative economic systems, emerging economies, trade, and debt problems. Mohamed Amal is Associate Professor of International Economics and Business at the Regional University of Blumenau/ Brazil in the undergraduate and graduate programs. He received his Ph.D. in Economic Engineering from the Universidade Federal de Santa Catarina/Brazil and has served as a professor at Halmstad University in Sweden. Currently is Research Scholar at the Columbia Center on Sustainable Invetsment/ University of Columba/ New York. Among other postings he has held a research internship at the University of Bonn while working on issues of globalization, FDI and Institutions and regional integration.